Forging(Hada): Forging is conspicuous Itame-hada, mixing in Mokume-hada. The entire hiraji surface is covered in speckled Ji-nie that generates reflecting irregular whitish Utsuri effect over the surface. Temper(Hamon): Hamon is a bit on stronger side Nie hard metal granules base, shallow wave NOTARE mixing in combined Gunome like a crab-claw and tassel-shaped Choji quench pattern where works with deep sparkling Nie and deep Noi mist-like crystalline area. Some temper shows splash a bit over the surface YUBASHIRI indication. In the interior of temper, there works with generous activities of Nie such as frequent Kinsen bright curved threadlike areas and Sunagashi long lines of Nie. Temper of tip(Boshi): Boshi forms irregular Midarekomi with intensive brushing away Hakikake indication. Tang(Nakago): Nakago is in UBU original. One peg retaining hole. Katte-sagari (slightly slanting left) filemarks. Back ridge of Nakago is flat. The Nakago is relatively short for it's long cutting edge, double-bevelled heel mark in full so called KURIJIRI. The signature in front is clearly chiselled, Bishu Osafune SUKESADA 備州長船祐定 and the other side is chiselled with the date of year In the 2nd month, 12th year of Eisho (1515) 永正十二年二月日. Powerful clans or generals from the disturbance period of Waring States Period to the Azuchi Momoyama state required massive volume and thick in kasane with high shinogi-ridge with well-harmonized curved. 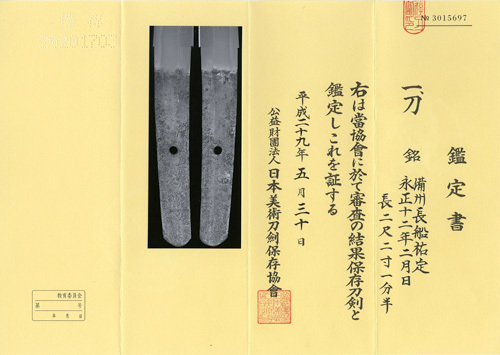 The latter half of Medieval Muromachi period, starting with The Ōnin War 応仁の乱 (1467-77), the length and style of Japanese swords had changed - Eisho-Daiei(1504-27) it was generally 2.0 - 2.1 shaku(60-63cm) which was suitable for one-hand grip, Kyoroku-Tenbun(1528-40) it had become a bit longer to 2.2 shaku(66cm), then Ganki-Tenso(1570-91) it became further longer to 2.3 shaku or even more(70cm) and Nakago became getting longer accordingly which was designed in the style of both hands grip. Japanese sword so called Sue Bizen 末備前, is sometimes called Eisho Bizen 永正備前 covers Bizen swords in Koto on after Eisho before Bunroku (ca.1504 - 95). Katsumitsu 勝光, Tadamitsu 忠光, Munemitsu 宗光, Kiyomitsu 清光, Sukesada 祐定 were the most distinguished sword makers. The subject sword is deep in curve which was designed for fast draw out from scabbard and suitable length for one hand battle. Extremely strengthened construction of high shinogi-suji ridge with massive volume of Hiraji. Durable Itame wooden structure forging method with a hard-side quenching with defused reflection of steel Utsuri, those were made for supreme sharp cutting performance. This katana presents typical workmanship of Sue-Bizen works in which Nakago remains nice taste of patina holding very good condition almost 500 years history, full of a brave Samurai spirit from the Warning States period. Original copper Habaki collar, preserved in a Shirasaya plain wood mounting. Recent polish/Condition scale: very good (using a scale of mint-excellent-very good-good-fair-poor).